Colonel Jeff Dunn was first appointed as Commissioner of the Alabama Department of Corrections on April 1, 2015. Commissioner Dunn, a native of Alabama, comes to the department after serving 28 rewarding years in the United States Air Force. He is a graduate of Birmingham Southern College where he earned a degree in English and a military commission through the Air Force Reserve Officer Training Corps. He holds a Master of Arts degree from Regent University, Norfolk, Virginia, and a Master of Science degree through the Advanced Studies of Air Mobility Program, Fort Dix, New Jersey. Commissioner Dunn held many flying assignments with over 3,500 flying hours in the B-52, C-141, C-9, T-37 and T-38 aircraft. In addition to serving as a joint planner for U.S. European Command Headquarters in Stuttgart, Germany, Commissioner Dunn served at the Pentagon as Deputy Director, Combating Terrorism and Support Activities for the Office of the Secretary of Defense; Senior Military Assistant to the Assistant Secretary of Defense for Homeland Defense and Americas’ Security Affairs; and, Chief of Rated Force Policy for Headquarters United States Air Force. His command assignments include Commander and Director of Operations, 75th Airlift Squadron, Ramstein, Germany; Vice Commander of the 14th Flying Training Wing, Columbus Air Force Base, Mississippi; and Commander of the Thomas Barnes Center for Enlisted Education at Maxwell Air Force Base, Montgomery, Alabama. 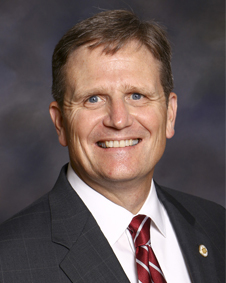 Commissioner Dunn resides in Montgomery with his wife, Susan, and two children son, Shaw, and daughter, Morgan.